Our area was settled predominantly by Norwegians who migrated from small farming communities in the Sognafjord, Telemark and a few other provinces. Only the village founder, William H. McFarland, was English of Scottish ancestry rather than Norwegian, but as a widower, he married a Norwegian widow lady with five children. 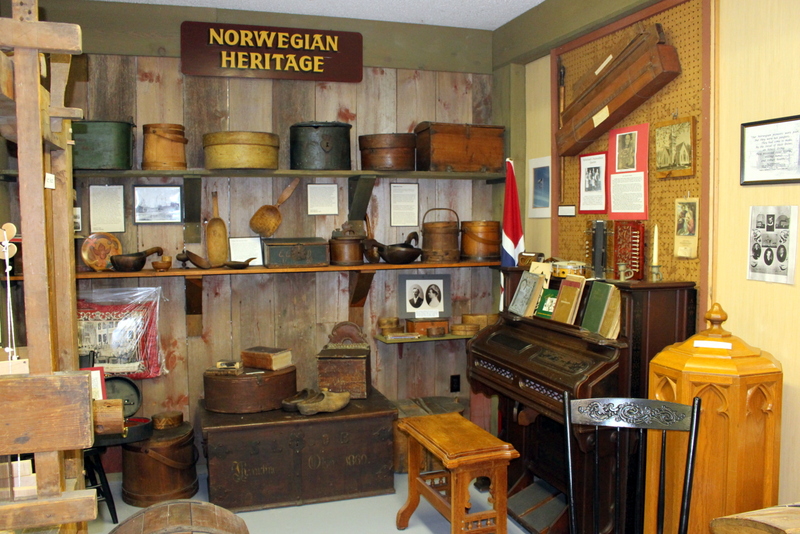 There are many handmade wooden items in our Norwegian display. Some were brought over from Norway and some were crafted in this country. 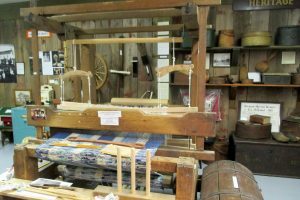 A large loom in the center of the display was taken apart in Norway, brought over by ship and put back together piece-by-piece. Spinning yarn and weaving material were important activities for folks used to a cold climate. Their love of music is reflected in this display by an old, well-worn fiddle and an accordion. A Norwegian family would likely own one but politely wait for the Lutheran pastor to leave before rolling back the carpet and playing a lively tune as they entertained guests. The ancient one-stringed Norwegian psalmodikon above the pump organ was used in early Lutheran churches until they could afford a proper pump organ. As early as 1840, immigrants from Norway began settling on Koshkonong Creek ten miles east of McFarland. Their first church was construction in 1844. Rev. Adolf Bredesen was the Lutheran pastor to McFarland and Stoughton in 1881. Years later he wrote a description of life of the early Norwegian pioneers. Ingebrikt Johnson was born in Nissendal on 1 October 1807 and married Helene Ellefsdatter Masterod 11 November 1831. When Ingebrikt and his wife left Norway they brought six children and had at least another six children while living in Dunn. The Johnsons bought much land south of the Yahara River and west of Mud Lake. A neighbor to the east of Johnson was Tollef Olson. Born in Telemark on 9 January 1831, Olson immigrated to Wisconsin in 1848, settling in the Koshkonong area. Ten years later he married Ingeborg Halvorsdatter Laurensen and settled in the Town of Dunn. Some of the other successful local Norwegian farmers included Sjur Johnson, Ole and Brita Dyreson, Dave and Asne Dyreson, Ole and Christine Elvehjem, Karl and Aagot Dale and Hans and Dorthea Sperle. These are just a few of the Norwegians in the McFarland area in the late 19th century who experienced the better life they desired for themselves and their children when they left Norway. Rosemåling in Norway originated in the lowland areas of eastern Norway around 1750. Rosemåling designs use C and S strokes and feature scroll and flowing lines, floral designs, and both subtle and vibrant colors. Script lettering , scenes, animal and human figures may also be included. Artists who specialized in rosemåling would travel from county to county, painting churches, homes and furnishings for a commission of either money or merely room and board. Thus rosemåling was carried over the mountains and toward Norway’s western coast. 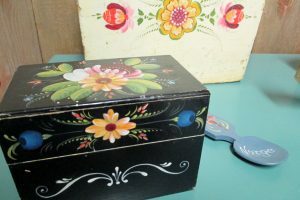 Rosemåling became widespread as amateur artists in rural areas often imitated this folk art. Norwegian immigrants brought chests, furniture and other items covered with rosemåling. The art form lost popularity in the U.S. after 1860 but was revived in the 20th century by Per Lysne who was born in Norway and trained in the craft. He came to America in the early 1900’s and was employed as a wagon painter in Stoughton, Wisconsin. When business slowed in the Great Depression, he began rosemåling again. Today, Norwegian rosemåling is taught in many areas of the USA.